What’s better than using light as a medium for art? Using light as a medium for 3D, interactive art! James Marshall aka “Dalek” along with Hurley is excited to present two art exhibitions titled “PSYCH OPTIC BLACK LIGHT FUZZ.” The first opening will be held on Tuesday, January 11th at 225 Forest in Laguna Beach; and next on Saturday, January 15th at The Hurley Gallery Space in Costa Mesa. The conceptual installations feature a fluorescent, multi-dimensional sculpture that becomes a free form interactive optical illusion. more via Hurley Presents Dalek: “Psych Optic Black Light Fuzz”. Courtesy of Holy Kaw, a stoplight that lets you know how much time you have to make the light before it changes. This is a great use of creative visualization for safety and tapping into human behavior. 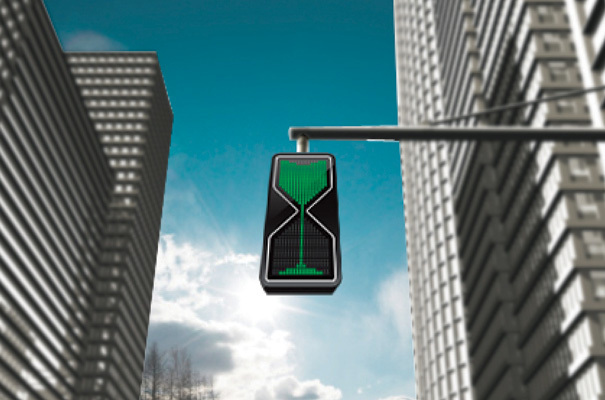 The Sand Glass is a new look at traffic lights. Surely people must be frustrated with the current design, which is why we have seen THREE DIFFERENT DESIGNS recently. Make this the fourth dimension using the sand-hour-glass as its model. LED lights trickle down to make an obvious statement, regarding the time left for the lights to change. Easy and intuitive. more via Ansel Adams, Street Photographer: 1940s Los Angeles : The Picture Show : NPR. This story came out back in October, and I’ve been hanging onto it until now because, well, it’s not like the mushrooms are prettier in the dark. They’re just bioluminescent. Lots of things can do that. But, it’s natural beauty, and it turns out the scientists were inspired by artists in naming this thing, so there you go. As if teensy night-lights were dangling from tree trunks and branches, glow-in-the-dark mushrooms illuminate the forests across the globe. Now, scientists have discovered several species of such radiant ‘shrooms. The freaky findings, reported today in the journal Mycologia, increases the number of aglow mushroom species from 64 to 71, shedding light on the evolution of luminescence in nature. The newly identified mushrooms, which emit a bright, yellowish-green light 24 hours a day, were found in Belize, Brazil, Dominican Republic, Jamaica, Japan, Malaysia and Puerto Rico. They include four species new to science and three new reports of luminescence in known species. A cool, if perhaps slightly involved, DIY: A clock that shows the time using words, not numbers. Great for the numeriphobe in your life! This is actually a pretty cool piece of art and technology. MAKE subscriber Doug took up the challenge to re-make the word clock he saw here a few weeks ago, and wrote in to share his project with us. He built the front panel using an etched PCB (no laser cutter required! ), and constructed a circuit board to illuminate the proper display sections using LEDs. Instructions and board layouts are available on his Instructable.